Many of the pictures I've painted in the United States are basically tree portraits, so these appear in the section of this website that is dedicated to trees. This section focuse on landscapes that are more broad in scope. "Beside the Green River" Oil diptych 10" x 28"
The two halves of "Beside the Green River" would hold their own as individual paintings, but I created them as a diptych. This is why you see a line in the center of the picture, which encourages you to look at the images both together and separately. "Wyoming IV" Monotype 4" x 5 3/4"
"Wyoming IV" is one of my favorite pictures in any of my mediums. Enough said. 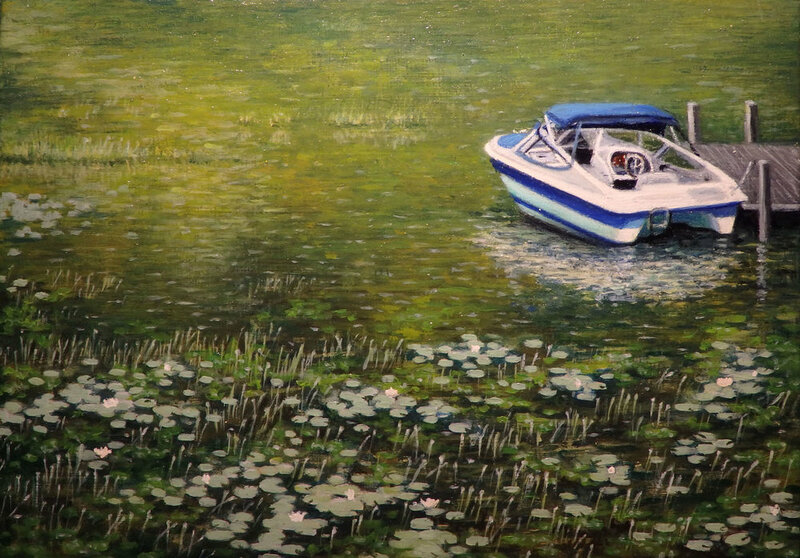 "Saint Regis Morning" Oil 3 1/2" x 6 1/2"
The scene in "Saint Regis Morning" was painted en plein air on the shore of Lower Saint Regis Lake at Paul Smith's college in New York's Adirondack Mountains. A curious male ruby-throated hummingbird came up close and looked me straight in the eye while I was painting! "Adirondack Swamp" Oil 4 1/2"x 6 5/8"
The location of "Adiriondack Swamp" is a spot hidden from major activity at Paul Smith's college in upstate New York. Paul Smith's is a private college that specializes in natural resources, environmental science, fisheries and wildlife science, forestry, recreation, biology, hotel and restaurant management, culinary arts and business. 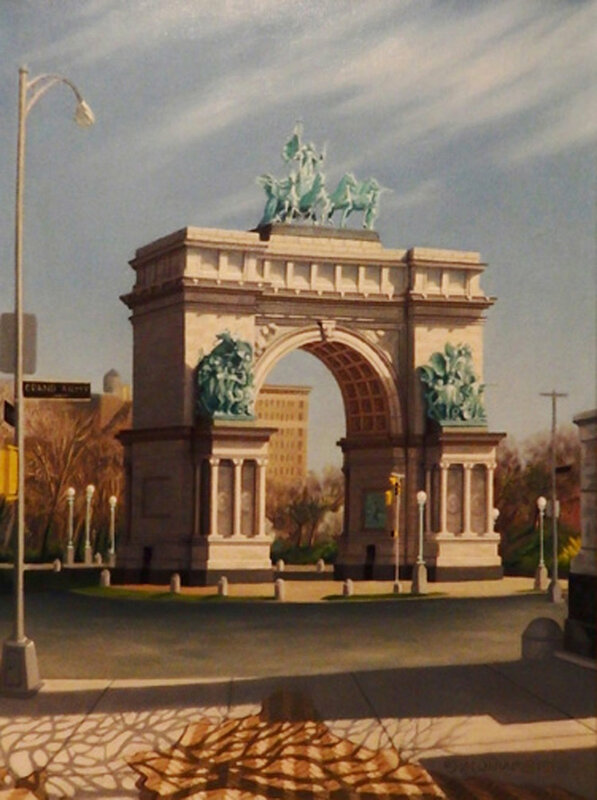 "Grand Army Plaza, Brooklyn" Oil 24" x 18"
"Grand Army Plaza, Brooklyn" was painted "en plein air" over the course of several sunny March days one year. The bronze sculpture on the monument was the last of Augustus Saint-Gaudens's major work. "A Quiet Corner" Oil 5" x 7"
"A Quiet Corner" is a scene on Lake George not too far from the scene in "Island in Lake George". "Island in Lake George" Oil 5"x 7"
"Island in Lake George" focuses on morning light on a lake in upstate New York near the border with Vermont. The bit of tree showing at the left helps to make this picture what it is, along with the light shimmering on the lake and background haze. 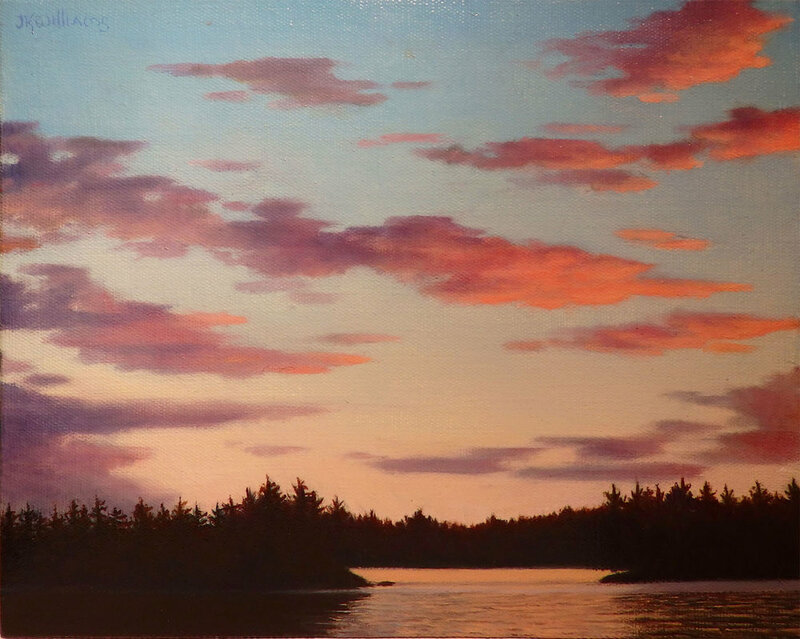 "Sunset, Upper St. Regis Lake, Adirondacks" Oil 8" x 9 7/8"
"Sunset, Upper St. Regis Lake, Adirondacks" was begun en plein air at a site near Paul Smith's college. "Goldfish Pond" Oil sketch 5"x 7"
"Goldfish Pond" is one of my rare sketches. I could have worked it to a high finish, but I chose not to. This is another one of my many works done in the Brooklyn Botanic Gardens, which is just a few minutes' walk away. "At the Acadian Shore" Monotype ghost 3 3/4" x 6"
"At the Acadian Shore" was inspired by my visit to Acadia National Park in Maine. This piece may appear somewhat ambiguous: Is that rock jutting out into space or into the water? The negative space in this print represents water. I chose to leave this area entirely white rather than to put in details here. "Wyoming IV" Monoprint 4" x 5 3/4"
The "Wyoming IV" monoprint was made by working with pastels on top of a ghost print of the first-run "Wyoming IV". The only place in this piece where you can see even a bit of the ink is in the far upper right, in the clouds. Everything else is covered with pastel. 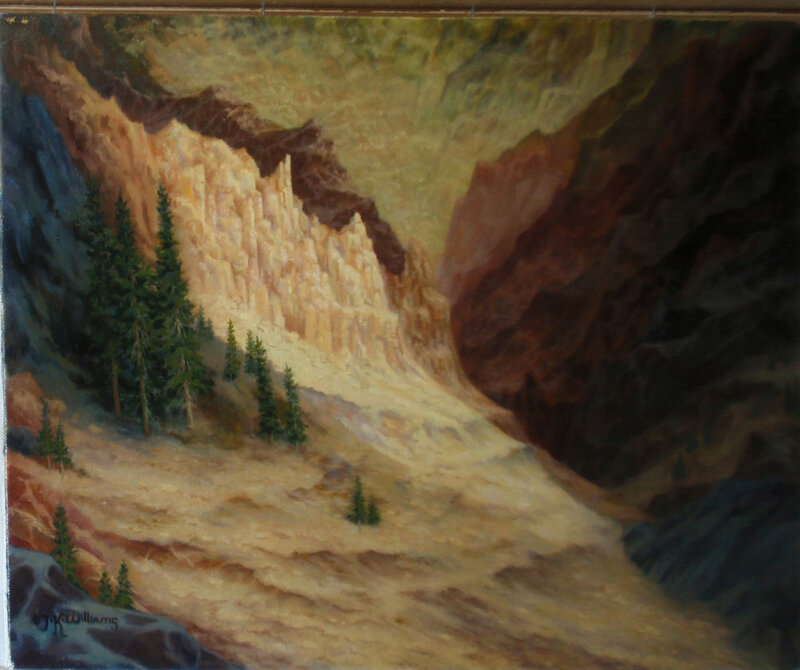 "Canyon Afternoon" Oil 16" x 20"
"Canyon Afternoon" was inspired by a dizzying scene of canyon upon canyon in Yellowstone National Park, Wyoming. "Wyoming I " Monotype ghost 5" x 6 3/4"
"Wyoming I" is a monotype "ghost", which simply means that there was enough ink left on the printing plate to put it through the press a second time and get an additional image. 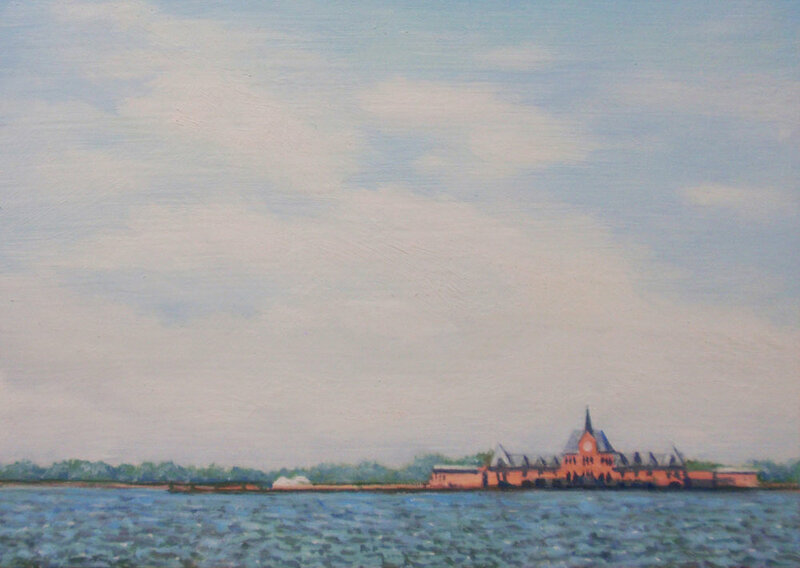 "Liberty State Park from Lower Manhattan" Oil 5"x 7"
I believe "Libery State Park from Lower Manhattan" is a view of the historic rail terminal in Liberty State Park in New Jersey. 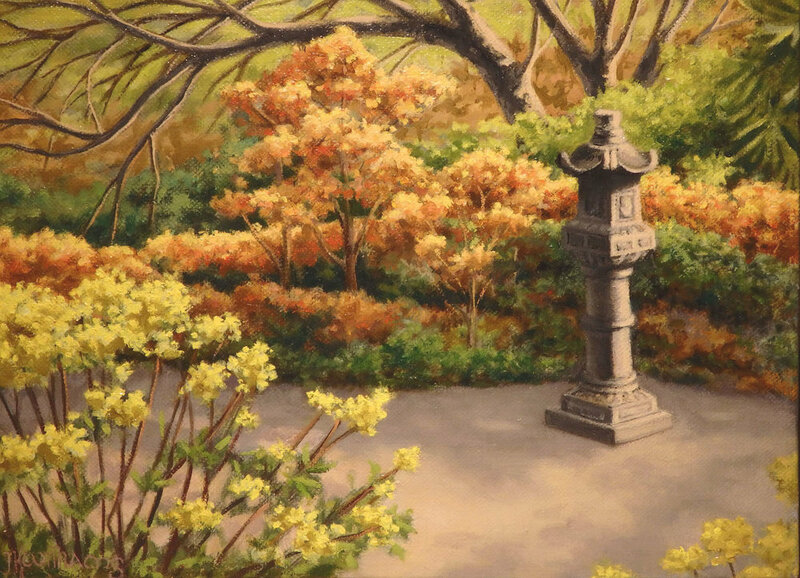 "Japanese Lantern" Oil 6" x 8 1/16"
"Japanese Lantern" was started at Brooklyn Botanic Garden and finished in my studio. Artists are generally not allowed to set up their easels in the Japanese section, but a friendly guard allowed me a day of exception, bless him! "Autumn Pastures" Watercolor 4"x 5"
"Autumn Pastures" is set at one of several properties in Westchester County north of New York City that maintain a commercial riding stable. Much of the land in this area is more suitable for use as pasture than for agriculture. "Wyoming Afternoon" is an imaginary scene based on typical landscape in Wyoming. 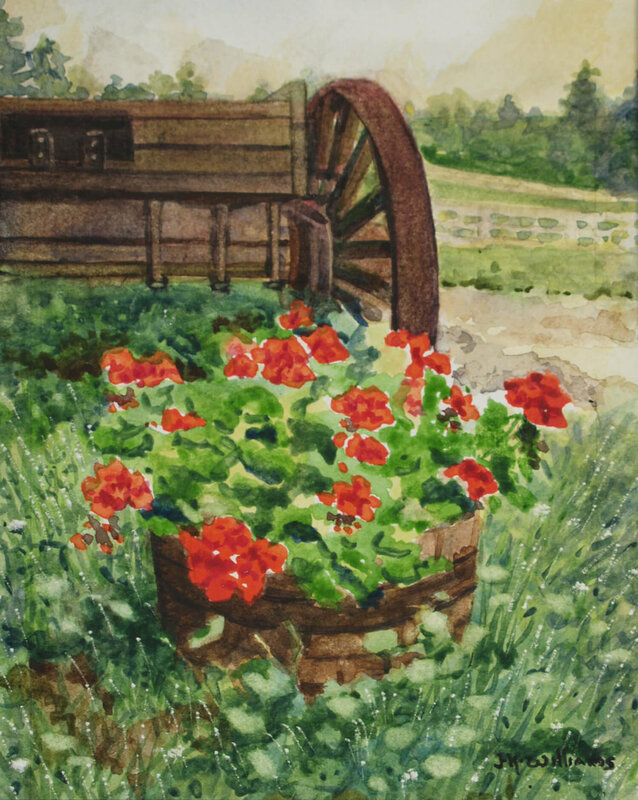 "Geranium Barrel" Watercolor 6 1/8"x 4 7/8"
The scene in "Geranium Barrel" was at one end of the stable on the property of "Autumn Pastures". This image appears in the Still Life section of this site as well. "Autumn Sketch" Oil 4"x 4"
I don't usually stop with sketches but work to a full finish of most of my works. "Autumn Sketch" is one of the rare exceptions. "The First Snow" Monotype 4" x 6"
"The First Snow" was inspired by a journey I made to Wyoming one autumn when it snowed on the last day I was there. This would have been in early October. 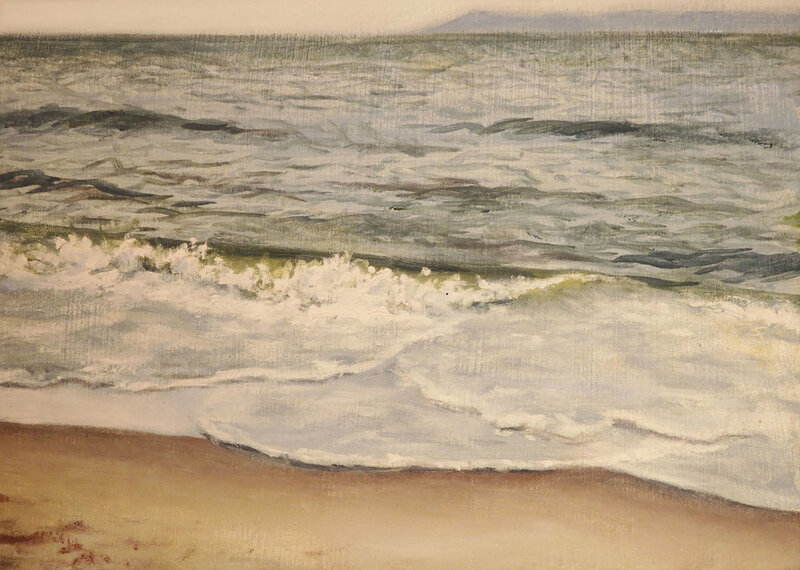 "Beach at Coney Island" Oil 5"x 7"
"Beach at Coney Island" was painted en plein air. Though this is the Coney Island, I did my usual thing and left out any people who wandered into the scene. "Morning with Gina" Oil 8" x 10"
"Morning with Gina" was started in Brooklyn Botanic Garden and finished in my studio. The title resulted from the fact that artist Gina Lento was working nearby. "Weir Farm Meadow" Oil 7 15/16" x 9 15/16"
"Weir Farm Meadow" was begun on site at Weir Farm National Historic Site. Is this a tree portrait or a landscape? "Lake Jenny, Grand Tetons, Wyoming" Monoprint 3 7/8" x 5 7/8"
"Lake Jenny, Grand Tetons, Wyoming" was done in pastel on top of a ghost print. You can't see the mountains very clearly due to the distant mists and clouds. The subject of this picture is actually the bright, shimmering light in the lake and the distance. "Woodland's Edge" Oil 8"x 10"
"Woodland's Edge" was a scene on the campus of Paul Smith's college in the Adirondacks in upstate New York. "Lily Pond" Oil 3 1/16"x 4 1/16"
"Lily Pond" was inspired by a scene in Brooklyn Botanic Gardens. Wild white waterlilies similar to these can also be seen in lochans in North Uist in the Outer Hebrides. "After Sunset" Monotype 2 3/4" x 4 3/4"
"After Sunset" is another piece inspired by my trip to Wyoming. "Lotus Pond" Oil sketch 3 1/8" x 5 1/16"
"Lotus Pond" is another miniature inspired by Brooklyn Botanic Gardens. "Sidewalk Blooms" Watercolor sketch 4 1/8" x 6 1/8"
"Sidewalk Blooms" may be more a still life than it is a landscape, though it was done outdoors at Brooklyn Botanic Gardens. "The Coming Storm" Monoprint 4 7/8" x 6 7/8"
"The Coming Storm" was made from a ghost print image. This piece was entirely imaginary. All copyrights to text and images are reserved by the artist.